Zirrus offers the ability to view your items in both a list and cloud view. With either view, items can be added with various priority levels which change the size of the font of the item. Items can also have tags associated with them for additional sorting. For a three minute overview of Zirrus check out the Zirrus quickstart demo. 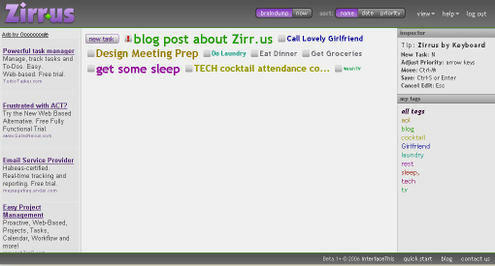 Bottom-line: Zirrus offers a simple, yet unique web 2.0 "to do" list product which could help to keep track of all of the things that come your way.